Fresh flavours alert! 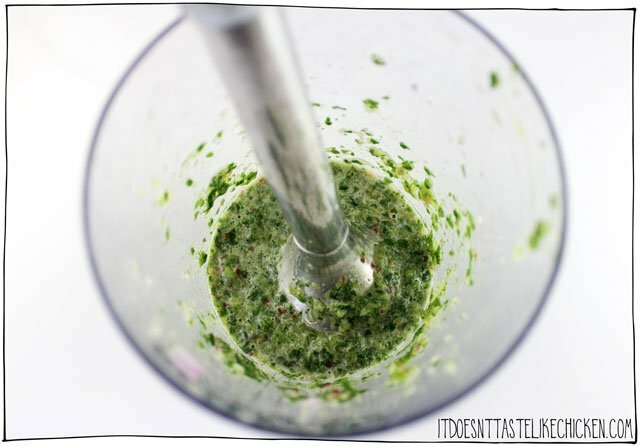 I have recently fallen in deep passionate love with this 5-minute chimichurri sauce recipe. Of course, it’s super easy to make, but dude, seriously, this is one amazing flavour bomb. 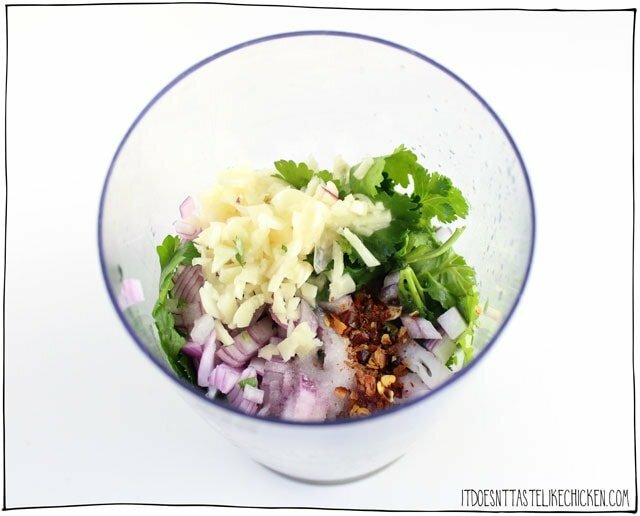 With parsley, cilantro, red onion, garlic, and lime there is so much punch to this sauce, it can take any dish from bland to fabulous. My version of chimichurri isn’t 100% traditional (name one recipe on my blog that is), but it’s definitely 100% delicious, and that’s all that counts in my book. Bonus points: I even have an oil-free option for those who prefer it. Just sub aquafaba (the liquid in a can of chickpeas) for the olive oil in this recipe, and bam! 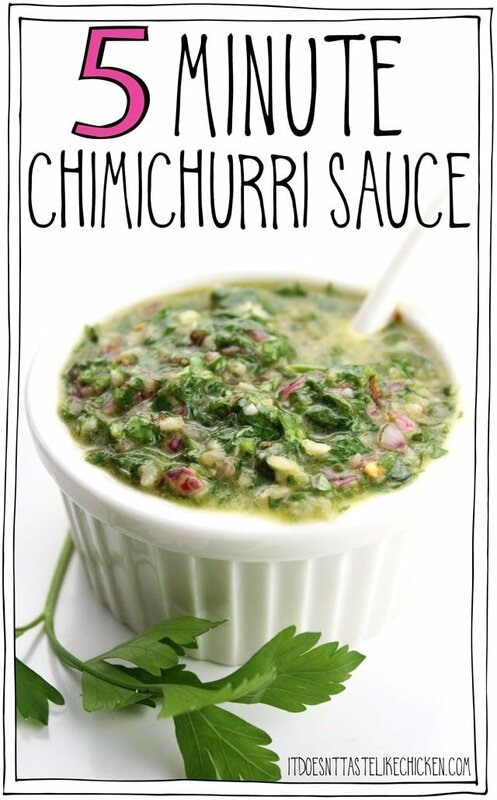 Perfect easy oil-free chimichurri. Use this sauce everywhere you want to take your dish up a notch. 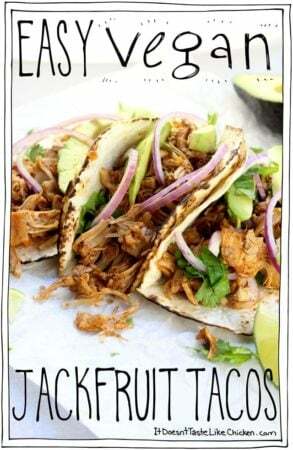 On a burrito or in a burrito bowl, on tacos such as my jackfruit tacos, on a vegan seitan steak, on roasted veg, on a tofu scramble, anywhere and everywhere you like! 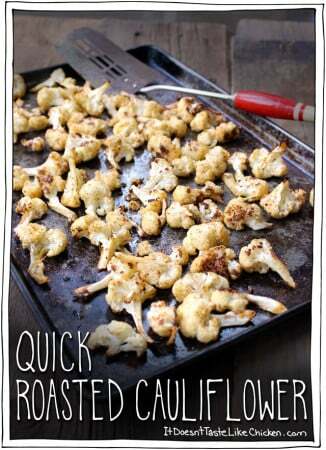 It’s such a quick and easy way to add some freshness and zing to a dish. 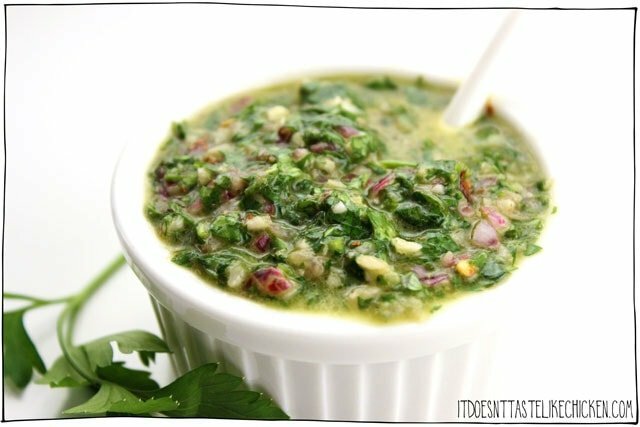 To make 5-Minute Chimichurri Sauce: Add all of the ingredients to a small blender, food processor, or use an immersion blender. I used this Kitchen Aid immersion blender which has been my go-to for blending up sauces and other small dishes for years. Blend everything together, stopping to scrape the sides as needed. I prefer a sauce with lots of visible texture, but if you prefer a smoother sauce, feel free to blend to the desired consistency. Use this sauce everywhere you want to take your dish up a notch. 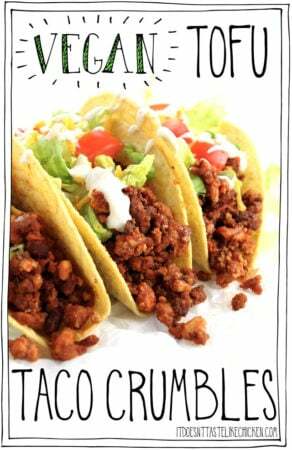 On a burrito or in a burrito bowl, on tacos such as my jackfruit tacos, on a vegan seitan steak, on roasted veg, on a tofu scramble, anywhere and everywhere you like! Add all of the ingredients to a small blender, food processor, or use an immersion blender. Blend everything together, stopping to scrape the sides as needed. I prefer a sauce with lots of visible texture, but if you prefer a smoother sauce, feel free to blend to the desired consistency. *If you don't want to chop the onion and garlic by hand, just add them to the blender first and pulse a few times until chopped. Then add all of the remaining ingredients. **135 calories per serving for the olive oil version. 19 calories per serving for the aquafaba version. There are 4 servings in this recipe. Thanks for another wonderful recipe! I really appreciated that you gave the no-oil option…I’ve been saving my aqua faba without really knowing when/how to use it and boom! Used it in this and it was fantastic. 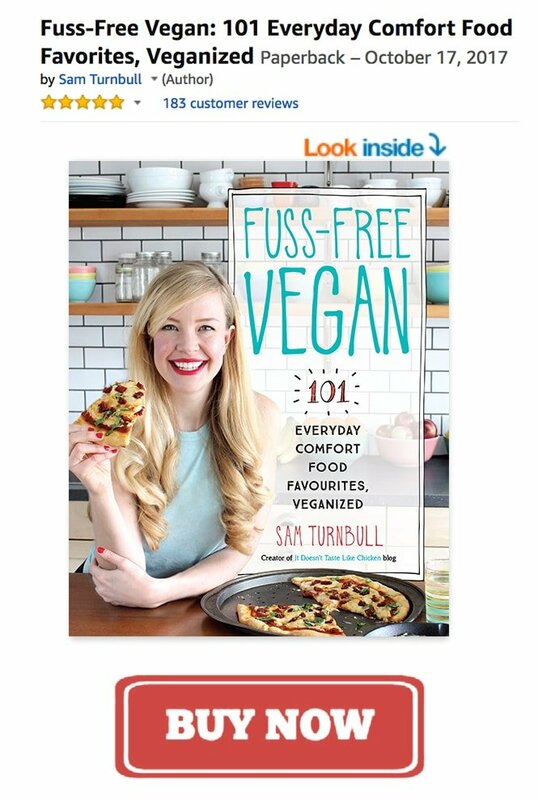 FYI, served it with your seitan steaks, also amazing…you are the best. I was once at s restaurant where my only vegan options were salad and chimichurri fries. The fries had chimichurri drizzled all over and baked again. They were the best fries I’ve had. 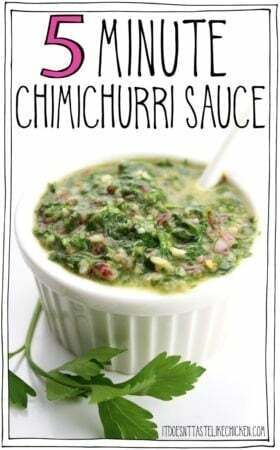 I’ve been wanting to make my own chimichurri and replicate that dish. This sauce looks amazing, Can’t wait to try it! This looks awesome! I bet it would also make a killer marinade for soy curls. It would also spice up the staple of rice and beans! Sunday nite dinner! 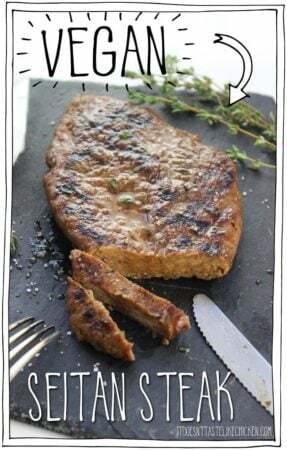 I am going to make a double batch and use half to marinate pressed tofu strips. So excited to try! Update. On Sunday, I made the tofu using the recipe to marinate the strips and also as a dipping sauce. It was good, but I thought it needed a little more depth. So last night I revisited the idea with my leftover chimichurri sauce. I made a marinade of tamari sauce, mustard, a little garlic, and onion powder and added a blob of the sauce (that I had puréed and added the pressed tofu sticks. I used the remaining chunkier sauce as a dip. That was great! We loved it and will be using the idea for an upcoming tailgate! 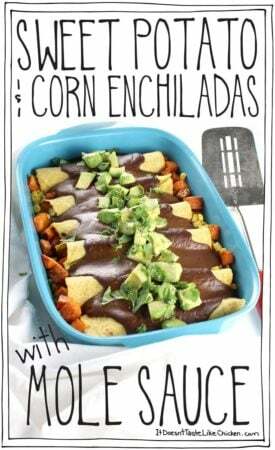 Ooooh sounds delish! Great idea.